Rennington Bed and Breakfasts. Compare latest rates and Live availability for all your favourite places and places you have always wanted to go using our new My Shortlist feature. Click + to add to your Shortlist. Bed and Breakfasts in Rennington, Northumberland for 1 night from Sat Apr 20, 2019 to Sun Apr 21, 2019 within 10 miles, in an Average Nightly price range of £1 to £200. Magnificent turreted beachside home offering an atmosphere of timeless tranquility. Secure parking. Totally non-smoking. Winner 'Pride Of Northumbria' Awards. Sunday Times 'Top 20 British Seaside Hotels'. Situated in the beautiful coastal village of Seahouses, The Links Hotel boasts an on site public lounge bar and restaurant, along with free private parking and free Wi-Fi. It is just 2 minutes' walk from the bustling harbour. The rooms feature a TV and tea and coffee making facilities. The en suite shower rooms have a hairdryer and complimentary toiletries. Free Wi-Fi is accessible in all rooms except in the annex. In the mornings, The Links Hotel serves full English breakfast. Both the cosy restaurant and the relaxed bar offer traditional evening meals. Dishes are freshly cooked to order and prepared using locally sourced produce where possible. 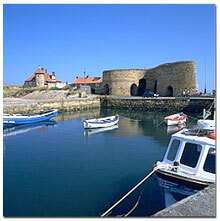 Seahouses is located along the Northumbrian coastal route, which offers beautiful beaches and historic castles. With a famous castle featured in the Harry Potter films, the market town of Alnwick is just 16 miles from The Links Hotel. Bamburgh Castle is 3 miles away. Seahouses' busy harbour offers boat trips to the Farne Islands. There are many activities in the local area including golfing, diving, cycling and walking. This fine lodge-style accommodation with stunning views has free Wi-Fi and an in-house bar and restaurant. Purdy Lodge offers friendly, efficient service and is located in an area of natural beauty between Alnwick and Berwick upon Tweed. The restaurant serves a range of meals, beers and wines. The lodge is just off the A1 and 8 km inland from Bamburgh. Longstone House Hotel is offering accommodation in Seahouses. 2.7 km from Farne Islands, the hotel provides a garden and a bar. Grill Bbq, Seafood and British dishes are served at the in-house restaurant. A Full English/Irish breakfast can be enjoyed at the property. The nearest airport is Newcastle International Airport, 78 km from the property. In picturesque Warkworth, with its well-maintained medieval castle, Roxbro House offers award-wining adult only accommodation just a 15-minute drive from Alnwick, the location for the Harry Potter films. Award-winning breakfast is served each morning in the charming, wooden-floored dining room. There is an Ã la carte menu to choose from, with food made from fine produce. From 17:00 to 18:00 daily, guests can enjoy complimentary wine and cheese. Situated directly opposite the 12th-century castle, the 5-star Roxbro House has free Wi-Fi throughout the building, and there is free private parking on site. Rooms are elegant in style, and traditionally furnished, with an en suite bathroom or a free-standing bath. All rooms have picturesque views, a TV with a DVD player, and tea and coffee making facilities. Hello and Welcome to The Farne Island Bed and Breakfast. Ideally located to the centre of the village and only three minutes walk from the Harbour. The Farne Island Bed and Breakfast will be your choice when visiting rural Northumberland. br / br / br / br / I have taken every care to make sure your room has been designed for the best possible stay with us. From the king sized pocket sprung bed with high quality sheets and sumptuous bedding to the modern d�cor and plush furnishings. br / br / br / br / Breakfast here at Farne Island Bed and Breakfast is a real treat. Starting with cereals fruit bowls a selection of yogurts and fruit juices you will be amazed by our grilled Full English and racks of hot toast that follows. I can also provide locally smoked Swallow Kippers or any breakfast of your choice. br / br / br / br / Breakfast is served 830-930 however 8am is possible by prior arrangement for early sailings (if necessary) of the Billy Shields all day boat trip. br / br / Breakfast outside these times is not available br / br / br / br / All produce is locally sourced to the highest standards possible. br / br / br / br / We endeavour to provide for all dietary requirements PLEASE MAKE ME AWARE WHEN BOOKING. Budget lodge provides quality low cost accommodation right in the centre of Alnwick. You will find this a great base for exploring the gems Northumberland has to offer. We have private off street parking and all rooms come with free wifi. br / br / br / br / At Budget lodge our number one priority is providing the finest top quality accommodation at the cheapest price. We have double twin family and single rooms available for solo travelers. All our rooms have full en suite facility s king size beds with the finest satin striped duvets and super soft towels 32 inch LCD TVs free WiFi and a generous hospitality tray. Our en suites come with free toiletries. We are based right in the centre of Alnwick and are only minutes walk to the famous Alnwick castle and gardens home of harry potter. All the facility s of Alnwick are right on our door step. We have secure cycle storage available and there is also an outside seating area available should you require it on a nice evening. Here at Budget lodge we are only 15 minutes drive away from the beautiful Northumberland coastline. At Budget lodge we pride ourselves on value and quality were always checking our prices and that of our competitors to make sure you always pay the cheapest price available in Alnwick for your accommodation we will not be beating on price guaranteed. All our rooms are furnished to a very high standard with everything you need available for a great stay. Quality is never compromised and we are here to make your stay as comfortable as possible. Budget lodge provides quality low cost accommodation right in the centre of Alnwick. You will find this a great base for exploring the gems Northumberland has to offer. We have private off street parking and all rooms come with free wifi.